SGLT1 antibody LS-C17804 is an unconjugated rabbit polyclonal antibody to mouse SGLT1 (SLC5A1). Validated for ELISA, IHC and WB. SLC5A1 / SGLT1 antibody was raised against a synthetic 19 AA peptide sequence of mouse/rabbit SGLT-1(402-420aa; extracellular domain #4). Coupled to KLH. Recognizes mouse SGLT-1. Species sequence homology: rabbit, bovine and sheep-100%, equine, rat-94%, porcine-89%, chicken-86%, human-84% SGLT-1. Mouse- SGLT-3, SGLT-4a/4b-84%, human SAAT/SGLT-3-78%, human and rat SGLT-2-63%. Suitable for use in ELISA, Western Blot and Immunohistochemistry. Western Blot: 1:10 ug/ml (ECL) ~70-77kD. ELISA: 0.5-1 ug/ml. 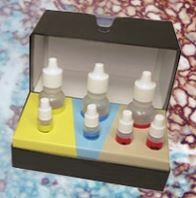 Coat ELISA plates with control peptide at 1 ug/ml.